This is a fun tower for my two year old cat. She loves playing with the holes trying to get out her favorite toys. Her favorite hiding spot is the middle cave. It sits just behind our main sofa so she can see over our shoulders. The very top perch isn’t very structured, only foam edges. So she just hangs over the side to grab the hanging mouse, doesn’t curl up to sleep there. That’s why I left off a star, because it would be more useful if it had cardboard sides around the top. 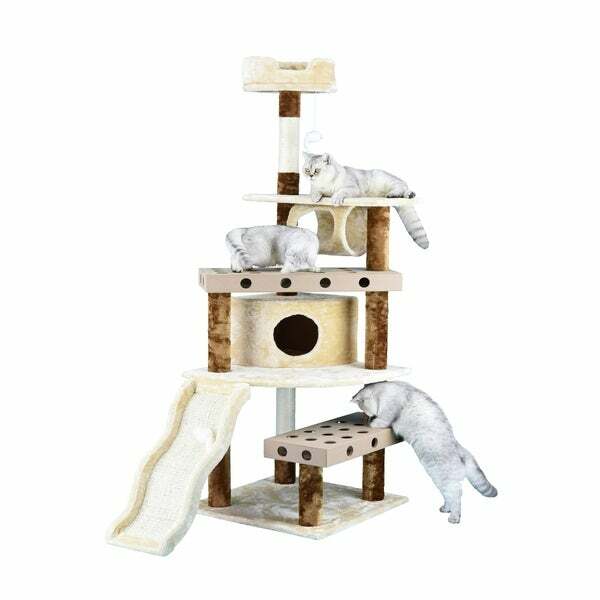 Entertain your cat for hours with the Go Pet Club IQ Busy Box Cat Tree. This cat tower is crafted with faux fur, pressed wood and sisal rope materials to keep your cat thoroughly entertained. An IQ busy box keeps your cat's mind sharp while several scratching posts keep your cat's claws away from the furniture. With hanging toys, sleeping spaces and other activities, this piece of cat furniture is a must have for any cat owner. I bought this cat tree for my 7 week old kitten. He loves it and there is enough to entertain him as well as places to sleep. The only issue he has is getting from the different levels and the top bed because he is so small but I'm sure he will grow into being able to maneuver the tree with ease. It has been fun watching the kitten discover all the tree has to offer. I think the cats will love scratching this!